My name is Cynthia Siegel, and I began writing this blog from Kolkata, West Bengal, India. So what’s the fuss about? 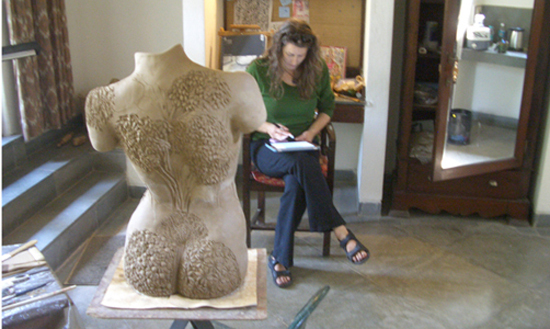 In the fall of 2011, I participated in an artist’s residency at Sanskriti Kendra in Delhi, India. Through the Sanskriti Foundation’s Museum of Terracotta, I was introduced to a vast diversity of traditional Indian techniques and processes in working with clay. I became extremely interested in the clay sculptural traditions in which the completed artworks are intentionally left unfired. Often these works are made collaboratively in conjunction with religious festivals, and at the ending ceremonies they are submerged into a nearby river. The sculptures are intended to commemorate the cyclicality of life, to promote healing, to absorb negative energies, and/or to refresh the family or village community life. These traditions are different than anything I have experienced before, and as a contemporary figurative sculptor, I felt myself drawn to the ethereal, fragile nature of these sculptural processes, and to the idea that after completion, these works are honored, appreciated, and subsequently restored to the earth. There is an enormous amount of creative labor expended to create these works, combined with the expectation of the works’ impermanence. I became so curious about this image-making process that I applied for, and received, the Fulbright-Nehru Award that funded this fabulous opportunity to live and work in Kolkata. We are so proud of you, you are so lucky to be able to have this wonderful trip to India. You certainly earned it and we are so happy for you. Your work is so beautiful. I’m enjoying your India photos and writing from afar and sending you much love and wishes for continued personal and professional growth and well-being during this season of miracles. I just read every page of your blog! What a wonderful journey and experience. Thank you for sharing it with stunning photographs and thorough explanation. There is so much color, vibrancy and rich tradition in India. Thanks for a glimpse into this ephemeral art: pandals, pujas, sari wrapped, dancing and joyful culture seen through your eyes. Just WOW! Thank you for giving me the honor of such thorough readership! At this very moment, the 2015 Durga Puja is taking place in Kolkata, and a part of me wishes that I was also there, to experience it all again. Just wanted to let you know that I love your artwork. Wishing you all the best this year!! !